On January 29, 2019, Ambassador He Xiangdong met with Hon. Nhial Deng Nhial, Minister of Foreign Affairs and International Cooperation of the Republic of South Sudan. Ambassador He said that last year President Xi Jinping and President Salva Kiir had a fruitful meeting on the sideline of FOCAC Beijing Summit, in which they laid out a grand blueprint for China-South Sudan relations. China always makes it a priority to help South Sudan achieve national stability and development. China will work closely with South Sudan to implement the outcome of FOCAC Beijing Summit, further strengthening bilateral cooperation in various fields. 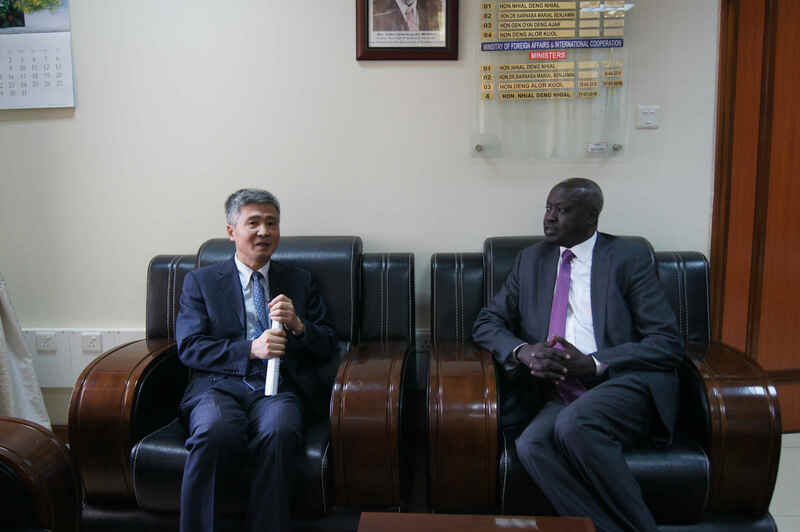 Minister Nhial said that South Sudanese government attaches great importance to South Sudan-China relations and commended China for supporting South Sudan in its development. South Sudan will strengthen cooperation with China to implement the consensus reached by President Salva Kiir and President Xi at FOCAC Beijing Summit. They also exchanged views on cooperation between the two countries on multilateral affairs.